Okay, Gentle Readers, I’m going to encourage you to visit another blog today. I’ve discovered an amazing new blog, written by an amazing young woman named Jill. Jill lives on a small farm in Wyoming and she blogs about things that I care deeply about, and other things that I want to learn about. Gardening. Cooking with whole foods. Jesus. Farm animals. Free-range chickens. Raising children. Making your own everything. Essential oils. And lots more. Raising heritage vs. hybrid hens. (Oh! That last one is mine!) 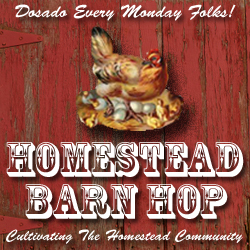 You can find all these homesteading-related links and hundreds more every Monday at The Prairie Homestead. I’m quite sure that the lovely Jill and I are kindred spirits, and when she asked me if I wanted to write a guest post for her blog a couple of weeks ago, I didn’t hesitate. “Yes–yes–yes–yes! !” I think were my exact words. I had an idea for a post that I felt would fit nicely into her blog, and she graciously agreed with me. Because of an amusing and frustrating work-related income change in our family, I’ve discovered that my “humble” skills of raising chickens and a big garden and a small orchard and a large family can certainly work together for good during lean times. Last summer when we were trying to catch our breath and pay our bills as my husband’s income dropped, I discovered that we could eat meal after meal after meal (after meal!) from my garden and my orchard and from the chicken house and really not miss much from the grocery store. I mean, really, it was a big eye-opener. We are eating better than we’ve ever done, and have less grocery money than ever. It hardly seemed possible, but it was true. No longer did I walk into the grocery store and drop a hundred bucks on groceries. Instead, I paid a lot more attention to what I was planting; I used the garden and orchard produce more carefully; I become much more creative with my cooking; I traded bread for produce and meat at Farmer’s Market every week. We bought very little processed food (well, the occasional bucket of ice cream found its way into the cart and fudgsicles are practically a staple out here, and I can’t grow my own rice . . . you know . . .) and I got really creative with the fruits and vegetables that we produced on our place. Kale chips are easy to make, and so much better for you than potato chips! Here is what I learned: this was all forced on me because suddenly we were grappling with how to live on much, much less, but it turned out to be a very good thing, and actually we eat so much better and wiser now. 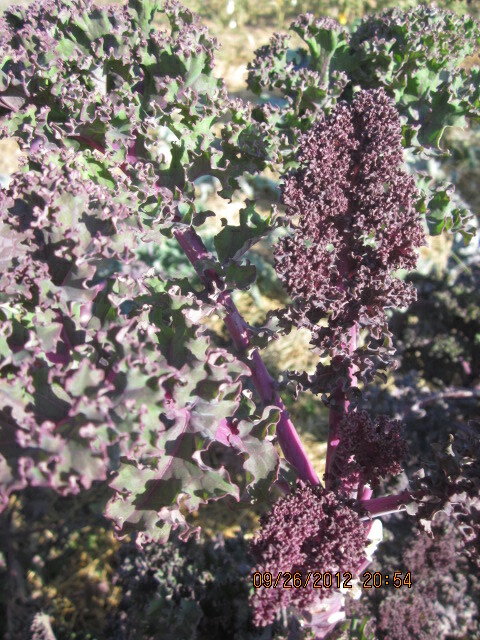 Kale is so much more nutritious than potato chips, for example. Homemade bread made with freshly-ground wheat is loads better-tasting and better for you than the “air bread” (my kids’ term) you can buy in the store. Pop and candy bars are a waste of money and actually are full of all kinds of stuff that probably you’re better off without. You can prepare eggs hundreds of different scrumptious ways, and if you’ve got really good eggs, nobody complains. All that back story is just to explain that I don’t spend a lot of money on fancy gardening tools. I just don’t. Well . . . I must confess that if I had the money for a fancy new mower with a rototiller and a grass bagger, and a huge mower deck and a dandy plow in the front . . . (sigh) I’d certainly buy one, but for now I’m thankful that my dear dad will come out and rototill my garden in the spring, and that we can still coax our used-up riding lawn mower to run. Most of the time. We have so much to be thankful for. No matter what, I will not forget that. My old hoes and shovels and trowels, if I take care of them, should last a long, long time. You just don’t need much fancy equipment to get a lot of goodies out of a garden! That said . . . I get pretty excited about anything that will help me use my time wiser, especially in the garden, where I tend to plant more than ten people could keep up with, when there’s only me and my two youngest kiddos (bless them)–Amalia and little Mack–to help. And that’s what I wrote my guest post for Jill about, a few new gardening tools that I’ve discovered this year and how they bless me and save me time and effort, every time I head out to my garden! If you have a garden or even just a few plants in pots, it’s so helpful to have a few great tools that help you do your gardening faster and better, isn’t it? These new things make me so happy, and make me feel so smart, and that’s a pretty cool deal, really. Read about my favorite new finds on The Prairie Homestead today. And then I’d love it if you’d make a note in the comments section below about any new garden tools that you’ve discovered recently that help you to garden smarter! We’re all in this together, aren’t we? ← Rhubarb-cherry-berry bread pudding for the Fourth of July! It’s wonderful that you eat so much unprocessed foods. Even us non-homesteaders could make some huge improvements in that area. What a positive story. It’s great to hear how you have become almost self sufficient; it’s most people’s dreams. Amazing that what could have been a negative situations turned out so well. You’ll all be so healthy eating this diet. The children will grow strong too. It never ceases to amaze me how healthy and strong my husband is. He grew up during the war years with rationing on meat and any form of protein. Everyone grew vegetables in spare ground around the areas. Those veggies were probably so much more nutritious than what you can buy in the store today, Francene . . . does your husband grow a garden today? How wonderful….more power to you…. As far as “black thumbs” go, I have plenty of failures, too, believe me! But the successes outweigh the failures. Don’t give up! I love this Amy, I have homestead envy, *sighs* one day. Still we’ve been cooking with the herbs I’ve grown this year and we’ve got plans for the garden, I shall be growing more vegetables. Then I suspect, April, that we’re kindred spirits, too! 🙂 Thanks for your sweet comment! When needs must sometimes you realise that it’s better that way. We had a dreadful produce harvest last year because of the terrible rains. All the blossom came of the fruit trees so the orchard was practically bare and the cold and endless wet meant that what did grow was weak and poorly. But this year is much better and I know how wonderful it is not to buy but to make. Am off to check out your guest post. But for the record my favourite gardening tool is this http://www.speedweeder.co.uk It costs pennies and is worth three thousand times its weight in gold. Thanks for that link! 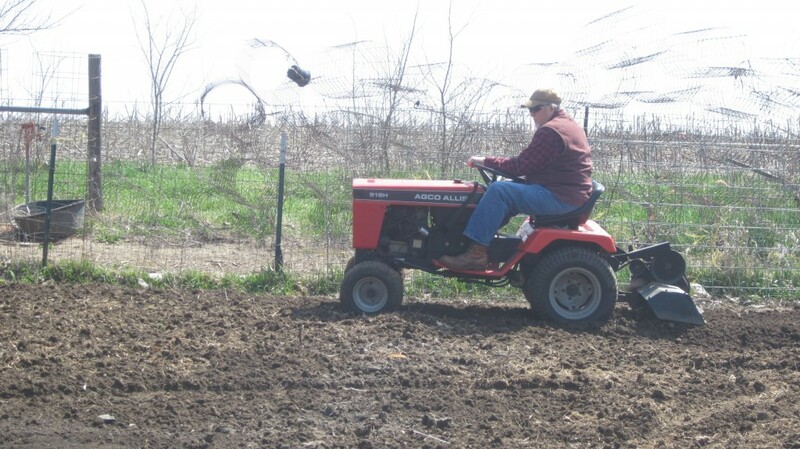 I don’t know if there’s anything like that available here in the US, but now (of course) I WANT A SPEEDWEEDER. It doesn’t seem very expensive, either. Do you run a commercial orchard, or do you have a smallish one like ours? One point I can totally agree with is that a loss of income can be a blessing in disguise (if you have the resources to deal with it the way you did.) Both my husband and I lost our jobs (within 3 months of each other) when we were married barely a year. We had been living fancy, eating out several nights a week and spending without a budget. Suddenly this came crashing down on us. We had to learn to shop smart (we were living in a city apartment at the time), learn to take advantage of sales, and, yes, cook. When my husband joined the Air Force, we had to cut down even more – and amazingly, our new dietary habits and exercise led to weight loss, and probably the best health we ever experienced. Sounds like a shared experience for many! The more grocery money you have, the more “treats” perhaps you indulge in. Once our grocery budget was cut, I focused in on buying only what was necessary and it was pretty simple to see what wasn’t. It’s a little scary, but it all worked out for good, it sounds like, for you. Thanks for sharing your experience! Amy, loved your post. I grew up in the country eating farm food. My parents didn’t have lots and so we made sure to be able to grow enough to support us. The milk came from the cows in our backyard and the eggs from another neighbor. The first time I bought meat in a store, I was 18. I didn’t like what it looked like. Moving to the city was a challenge to me as I couldn’t figure how people could afford to eat real food (my opinion). I adapted to the city way of eating which I know is one of the main reasons I gained so much weight. We’re looking to buy another home in the near future and plan on having a garden that I’ll enjoy eating directly from it. In the meantime, we’ve been running around for farmer’s market, enjoying the food but obviously not the price. We still pay for it knowing we want to encourage farmers. Thanks for sharing your story. Will be looking forward to reading what’s next. Thank you Claudette, for your comment! I grew up much the same way, though we lived in town and didn’t have a cow. We did have a few chickens, and Mom always put a huge garden in. Good eating all year ’round with freezing and canning! We have been cooking from scratch for years. I am hoping to get more canning, freezing and our new thing this year, drying foods. We have goats, some chickens, garden and some apple trees (we are hoping they are good this year) any tips for bugs, and herbs. I am trying to save money for the winter this year.